I have spent today knocking on hundreds of doors and talking to people about a whole variety of issues - I love that side of elections, I really do. Discussing local issues, outlining my own thoughts, and encouraging people to vote is what elections for me are all about. Thank-you to the numerous people that have helped my campaign today - I really appreciate it!! What I dislike most about elections however is the nasty comments from other candidates and supporters and the accusations that they are prepared to make about somebody's character - often when they are without the full facts. I always avoided this and try to avoid engaging in personal criticism about the other candidates, even when encouraged to do so by the public. I do however get annoyed when people deliberately mislead the public, and where necessary I attempt to set people straight, but on the whole, negative campaigning gives politics a bad name. 1. Do I get paid for some litter picking services? I currently supply services to Thetford Community Association, a registered charity, on a self employed basis. I have done this since 2009 - before this date, I supported the TCA in an entirely voluntary capacity, since its creation in October 2000. The support that I provide is very varied but mainly focuses on project management / co-ordination, particularly in relation to the community football coaching project and the horticulture work that the TCA undertakes. I also write funding applications on behalf of the charity and take care of monitoring reports etc. As part of this self employed work I personally ensure that the Ballpark is kept clean, safe and usable - and as part of this, I do on a regular basis clean the Ballpark, i.e. I remove the broken glass, the dog faeces and any other dangerous materials and I do pick up the litter when necessary. I allocate 2 hours per week for this, but it nearly always consumes more than 2 hours worth of my time - for which I do not claim for. 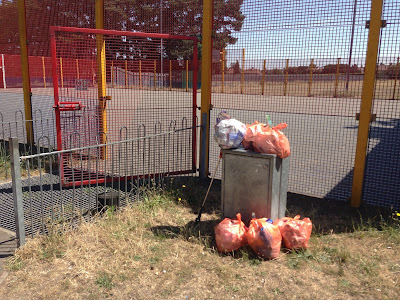 I also participate with, and help organise litter picks on a voluntary basis in a variety of areas in Thetford and have done so for many years. Some of the rubbish collected during a recent Ballpark litter-pick. 2. My support for Thetford Free School; Nico Dobbin, the Principal Designate of the Free School used to be my teacher - so you could say I have a vested interest in this, or you could say that I know those behind it well enough to know that it would be the type of project that I would wish to support. The Thetford Free School will cater for those young people that are shut out of mainstream education and those at serious risk of falling into a downward spiral. The staff involved have the best interests of the children at heart and are very good at working with this hard to reach group. Since Conservative led Norfolk County Council removed services such as Norfolk Youth Service, Connexions and then closed the Thetford Pupil Referral Unit - this has made the sort of provision that the Thetford Free School will provide even more crucial. I have been a long-standing supporter of the Free School for Thetford, and find the comment expressed on Twitter earlier that I am only supporting it now because of the impending by-election, to be particularly distasteful. 3. Bus station campaign - "What bus station campaign?" asks Tristan Ashby. Not for the first time my Conservative opponent in this election shows his naivety and lack of local knowledge with this question. There was a Parish Poll on where the bus station should be sited, it was a simple yes or no question - i.e. Do you support moving the bus station, or not. I was a member of the Vote No campaign team. I co-ordinated the design and printing of the Vote No literature and I stood outside numerous supermarkets and in the Town Centre talking to people about the poll and discussing why they should vote. I lobbied for the Town Council to support the poll, which they did. For the record, Conservative Town Councillors voted FOR moving the bus station, AGAINST having the Parish Poll, and then AGAINST promoting the parish poll when they lost the vote on whether to have one at all. That's right - they voted AGAINST promoting an election to people where they had a democratic right to vote. 4. Norfolk County Council / Charles Burrell High School; We have known for quite sometime that CBHS site will cease to be used for education. I was very aware from an early stage that it would be crucial to the Barnham Cross community, particularly, that part of the school remained of use to the community. Thetford Dolphins had also lobbied the Town Council as they had been made aware that at some point they would not be able to use the site. I spoke with my two fellow District Councillors for the Saxon Ward - Sylvia Armes and Mark Robinson. I drafted a letter to Norfolk County Council on the matter and asked Sylvia and Mark if they were happy to add their names to it - Sylvia agreed, and then Mark agreed, which I was pleased about. Because, despite the fact that Mark is a Conservative District Councillor, I believe that once elected we should all work together. Interestingly, I can recall that Mark got into trouble with his Conservative colleagues for signing the letter with us. That letter led to a meeting with Norfolk officers at County Hall - Myself and Sylvia attended this, but Mark was unable to. The then County Councillor for Thetford-West, Mr Mike Brindle was also invited, but could not make it. Officers at the meeting made clear to us that the Conservative Cabinet member responsible for what would happen to the land once the school had finished using it (Cllr Cliff Jordan) had made it clear that they wanted the best possible financial result from the land and that community use wasn't favoured as "Thetford already has enough community facilities' and that sort of usage wasn't sustainable and there was no business plan etc - indeed, there wouldn't be, but one could be pulled together if there was the political will to make it happen. 5. Town Council support for groups that I am involved in; Yes, groups that I have been involved with have received funding from Thetford Town Council - when required I always declare whether I have a disclosable pecuniary interest - as per the code of conduct, and my necessary details are recorded accurately on my register of interests - held by the Council and available for all to inspect. I have not taken part in votes when organisations that I get paid to support have had financial contributions discussed. This is the type of mudslinging that I particularly dislike - I could highlight all sorts of 'dodgy' goings on with local Conservative Councillors, but I won't! Mr Terry Jermy, interesting piece, I'd like to query a few points from my local knowledge of the situation. I too disagree with the bus station move but the parish poll was a cost to the tax payer and wasn't binding on Breckland Council so seemed to be a waste of money. While all above board I'm sure, I don't think town councillors should be be paid for community work or put themselves in a position where their credibility is questioned. Ethically I believe it to be wrong. If you accuse someone of 'dodgy deals' you should report him/her immediately, otherwise you are guilty yourself through lack of action. Dear Mr Sturman, thank-you for your reply. I do not think that Councillors should be put off from being members of community groups by preventing those groups from accessing support from the Council. But everything should be open and transparent. In a small town like Thetford some Councillors will have financial interests in Council services, a good example would be Mr Pat Pearson, as he used to provide skip hire of course to the Town Council, or another example would be Kybirds Building services - as long as everything is done above board and fairly, then that should be O.K. Where things have happened that I have had issue with then I have asked for my concerns to be recorded - I can direct you to the relevant Council minutes if you wish? With regards to the Parish Poll, it was never going to be binding - but, up until that poll Breckland Council and William Nunn particularly insisted that it was a "vocal minority" who objected to the bus station moving. The parish poll successfully changed the debate in that everybody then knew that MTF and Breckland were moving the bus station without the support of the Thetford public. I think the total bill for the poll was £4,000 - which I would much rather have spent on other things. But to give people a democratic opportunity to object, was money well spent in my opinion.